Unless properly managed, the transition to an EHR can create havoc on the release-of-information process. Pain is a natural part of the transition from paper to electronic. For the clinical side of the house, it typically lessens as familiarity with the new EHR system increases. For those involved in the release-of-information (ROI) process, however, the pain can continue for years until a tipping point is reached. Most facilities follow a date-forward process when transitioning to an electronic environment or converting to a new EHR system. Records that were created or updated prior to that date remain on paper or in whatever electronic format was in use previously. As a result, fulfilling ROI requests often means pulling information from multiple systems. “Eventually, once you’re far enough out to have the full legal record [in the EHR], it becomes more efficient. … Until then, it’s a matter of communication and documentation,” says Abatjoglou. Indeed, locating and accessing the paper medical record was a primary challenge for Broward Health Coral Springs Medical Center, an IOD client, during its transition. The hospital based in Fort Lauderdale, Florida, took three years to finalize its conversion—three years during which charts were split between paper files and the EHR. With the conversion complete, Broward Health is seeing the benefits to the ROI process. For example, the process is far more efficient now that all the information needed to fulfill a request can be accessed immediately from one location within the EHR. It also has helped speed the revenue cycle by enabling faster processing of ROI requests related to claims and payments. Finkelstein credits solid policies and procedures, open communication, and ongoing education and training with enabling Broward Health’s HIM departments to successfully navigate the hybrid world. Knowing where to find information to fulfill ROI requests is repeatedly cited as one of the most challenging aspects of functioning in a hybrid environment. Facilities that address this challenge early are often the most successful at navigating what can be treacherous waters. According to Kim Murphy-Abdouch, MPH, RHIA, FACHE, a clinical assistant professor and clinical coordinator in the HIM department at Texas State University, a comprehensive workflow analysis is critical to designing procedures to successfully manage ROI during and after conversion. For all types of requests, the analysis should follow the release process from start to finish. “It begins with defining what the legal health record is. That’s policy. Once you have the legal EHR defined as policy, it drives the workflow and processes for ROI,” says Murphy-Abdouch, adding that it’s important to understand what EHR content needs to be provided to fulfill different types of requests. This is the approach taken by South Jersey Healthcare, which includes two acute care hospitals and more than 40 outpatient and satellite facilities. It started with evaluating the policies and procedures governing ROI and making changes as necessary to accommodate the new environment. “From day one when planning the roll out, we kept going back and defining the legal record and what is being released. That was always the big picture. It’s something you have to think about, and it’s something you have to define,” says HIM Director Michele D’Ambrosio, MBA, RHIA. With the legal record defined, South Jersey Healthcare undertook a comprehensive workflow analysis to identify the best approach for accessing all the data required to efficiently and accurately fulfill ROI requests. It also met extensively with its ROI vendor, MRO Corp, to ensure its processes were compatible with the new procedures that would be implemented during and after the conversion. “We knew we were going to roll this out so we did a lot of work ahead of time. We looked at vendors to make sure they could do what we needed them to do. We wanted to make sure they weren’t just printing out records and scanning them into their systems,” D’Ambrosio says. Ultimately, the workflow analysis should dictate processes to be followed by both the facility and any vendors involved in fulfilling requests. It should define policies and procedures governing when, how, and by whom information is accessed. This will become even more critical as new disclosure regulations under HIPAA take effect. In fact, Hardwick recommends procedures be established to create a single point of disclosure that could even extend to hospital-owned practices and clinics. This would help prevent improper disclosure, something that can happen far more easily in an electronic environment than in the paper world. HIM, as the traditional guardian of the medical record, is the most logical location for such a plan. “Their expertise is the best place for it to continue to reside,” says Hardwick. Because they outsource some or all of their ROI function, neither Broward Health nor South Jersey found it necessary to increase staffing to accommodate the extra work involved in managing the process in a hybrid environment. However, most agree that even when additional staff isn’t needed to manage the process, new skill sets are. For example, pulling and copying records in a paper world is fairly straightforward because the information is generally available in the patient record either in the facility’s HIM department or at off-site storage. According to Abatjoglou, that is not the case in the electronic world. Staff must demonstrate a high level of competency in an EHR environment and understand the laws governing record releases. Thus, while comprehensive procedures can go a long way toward ensuring an accurate ROI process in the hybrid and electronic environments, additional staff training and education are imperative. That training should focus on enhancing the technical skills necessary to manage both the conversion of a chart from electronic to paper and accessing the data to process requests. According to Murphy-Abdouch, whose background includes hospital operations, HIM, and finance experience, when any portion of records resides in an electronic environment, the clerical skills take on a far less significant role. Murphy-Abdouch cites an encounter she had as a consultant working with a hospital on the transition to electronic records. Using the new system, ROI staffers could select a document and autofax it directly from the EHR to the requesting office. The staff was fully trained on the feature, yet she observed one staffer print out and manually fax information. Nilda Tamburello, RHIA, vice president of ROI for Medical Record Associates, concurs, adding that training can be a lengthy undertaking due to the complexity of managing a process that requires collecting information from multiple sources and in multiple formats. Indeed, records can be found on multiple media types even within one department. For example, there may be paper records as well as electronic records, microfiche, and even scanned documents stored on CDs. Further, once a facility has completely transitioned to electronic, chances are high that information required to process various ROI requests will still reside on multiple systems. If anything, maintaining the integrity of the information being released is more complicated in a hybrid environment. Because one mistake can spread like wildfire through multiple systems, the need for highly focused quality assurance is greater than ever. This is especially true if the integrity of the master patient index (MPI) was compromised at the time the new EHR was implemented, leading to overlays and duplicate records. This can be particularly problematic for ROI vendors. She notes that electronic environments create more options for handling ROI. More options require stronger policies and procedures to govern access and disclosure. These policies and procedures must also be updated as technology advances throughout the enterprise, in particular to ensure that staff understands where to find information within the EMR and how it flows through the system. Hospitals can’t hit the pause button on release of information (ROI) just because they’re transitioning from one environment to another. Whether records are on paper, in an EHR, or somewhere in between, they still must be accessible to fulfill requests quickly and compliantly. “The hospital might decide to change systems [but] nobody slows down sending out requests. The work still has to be received, properly processed, and returned in a timely manner. 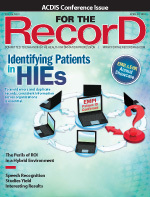 It can be very resource intensive for the hospital and specifically the HIM department to manage the changes while keeping up with day-to-day operations,” says Steve Hynes, president of MRO Corp.
It’s a common but erroneous assumption that transitioning to electronic records will reduce staffing needs around ROI. In fact, personnel requirements initially can often increase to avoid backlogs as staffs adjust to new procedures and systems. There is also a need for specialized expertise to design the ROI process, train staff, and in some cases, assist with the actual implementation. Kelly Quigg, product manager of interfaces at HealthPort, concurs, noting that moving to an EHR is a very labor- and education-intensive process for most facilities. Outsourcing ROI is one way to lessen the burden. It can also provide access to expertise that many hospitals don’t have and are unlikely to need for the long term. Ultimately, vendors and hospitals have the same goal with ROI regardless of the environment in which the data reside. And both must go through the same learning process. For vendors, the learning curve is accelerated because they can focus their internal resources on just one thing: managing the ROI process.